Available from Longaberger for October only are two Xmas editions, the 2004 Tree Trimming Gumdrop Basket priced at $49, and the Holiday Mugs Set priced at $24. 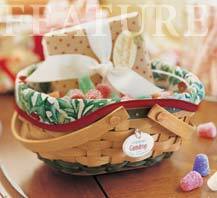 Visit the Longaberger web site for more detail. Images are Copyright (c) of The Longaberger Company.